The winery is located on the Old Creek Ranch, which is part of a 22,000-acre Spanish land grant (Rancho Ojai) awarded to Don Fernando Tico dating back to the early history of California. 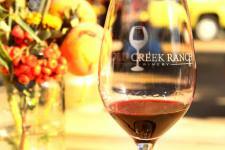 Today the Old Creek Ranch is an 850-acre cattle ranch with a winery and fruit orchards, owned by the Holguin Family who purchased the property in June 2015. The winery currently outsources grapes from northern Santa Barbara County and the Paso Robles area, although the owners are in the process of installing new vineyards and eventually will have 40 acres of vines at the Ranch. Tasting Room open Friday 11-4; Saturday and Sunday 11-5. Picnics are encouraged.